How does a snowblower work? What's the difference between single or two-stage snowblowers? What kind of snowblower is best for me? 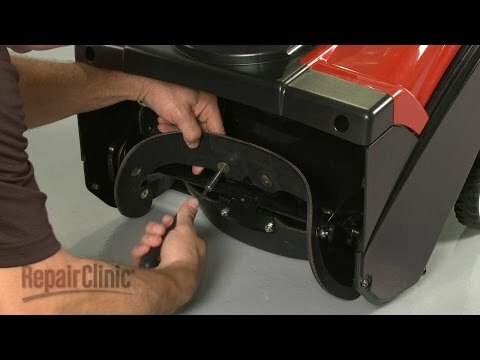 How do I clear a jam in my snowblower? A snowblower makes it easy to clear snow from walkways, driveways and other areas. Like other outdoor power equipment, the snowblower must be properly maintained for safety purposes and in order to operate efficiently. If you have a four-stroke engine, the oil level should be checked after eight hours of use. It should be replaced every 50 hours of use or once every season. Fresh oil is a golden or amber color. As it ages, it will darken. Check your owner's manual for the proper viscosity oil to use in colder temperatures. Note that two-stroke engines do not use engine oil. Before replacing engine oil, check your owner's manual for the recommended way to tilt the snowblower. It varies from model to model. Unscrew the drain plug and release the oil into a bucket. Replace the plug and add fresh oil, as recommended by the manufacturer. Used oil should be recycled. Most small engine repair shops and auto parts stores have a free recycling program. Call your local shop for more information. Find oil for your snowblower. There is high risk of damage to fuel filters if cleaned so replacement is recommended. Also, it is nearly impossible to determine if they are clogged. Find a fuel filter for your snowblower. Spray a degreaser on greasy and dirty areas. Allow the degreaser to sit for 10-15 minutes before wiping with a clean cloth. Fuel stablizer keeps fuel fresh longer and prevents clogs in the carburetor. Follow the owner's manual for instructions on leaving fuel in the engine during storage, as this varies by manufacturer. Fuel caps have small vent holes to allow air into the fuel tank. If the fuel cap air vent holes are blocked by buildup or debris, replace the fuel cap. During the off season, cover or close the fuel cap vents. Check the tires for wear. If your snowblower has pneumatic tires, use a tire pressure gauge to check the air pressure. Lubricate wheel bearings, auger bearings, and the impeller bearings - Lubricating moving parts periodically will make sure all parts turn and move correctly. This lithium-based grease is ideal for lubricating your snowblower's bearings. Do a thorough job checking the scraper blade and slide shoes (a.k.a. skid shoes) for wear. These parts have the important job of protecting the housing from damage. Replace these parts if they have worn dangerously thin or are damaged beyond repair. The tiny but mighty spark plug should be replaced at least one per season, even if it appears to be working fine. Over time, a spark plug's performance will degrade due to carbon build-up and a weakened electrode. This dramatically increases emissions, reduces engine performance and increases fuel consumption. This spark plug wrench enables you to safely and efficiently remove or tighten a spark plug in your snowblower, lawn mower or other small engine. For single-stage models, take a look at the auger paddles. If they have worn down so much that they no longer contact the ground, they should be replaced. Never let the rubber wear to a point that metal is exposed. That can cause major damage. Enter your snowblower's model number to find replacement auger parts for your model. Single stage models use an auger to scoop snow and discharge it through a chute. Two-stage (a.k.a. dual stage) models use an auger to collect the snow and a high-speed impeller to discharge it through the chute. A single stage electric snowblower is a good option for clearing less than four inches (about 10 centimeters) of snow from a deck or porch. It requires use of an outdoor power cord. A single stage gas snowblower is best for clearing less than eight inches (about 20 centimeters). A dual stage gas snowblower is ideal for clearing medium to heavy snowfall greater than eight inches (approx. 20 centimeters). While some clogging may be inevitable, we use a no-stick spray on areas that come into contact with snow. This will reduce the number of jams. Be careful when clearing a snow or ice jam. People suffer serious hand and arm injuries when they attempt to clear snowblower jams with their hands. Snowblower augers will continue to spin for a while after the bale arm located at the handle has been released. Therefore, one should never place a hand or arm inside of a chute. Thick gloves will not prevent injury. Instead, a small shovel or the end of a broom should be used to clear snow and ice jams in the auger housing or chute after the motor has been shut off. Ice can be projected at high speeds and cause serious eye injury. Always wear a pair of safety eye glasses. Children and pets should remain indoors when a snowblower is in operation because the cloud of snow created by the snowblower or snowthrower while in operation hinders visibility.